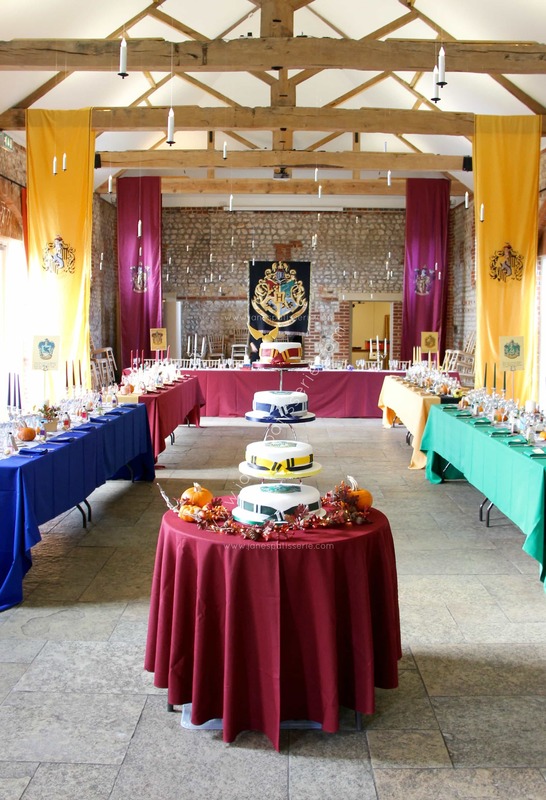 So, my lovely friend asked me to make her parents Wedding Cake and I was obviously astounded to have been asked to complete such a task, because in my eyes the cake is VERY important.. and then I found out it, and the wedding itself, was Harry Potter themed. YES! Holy Smokes was I excited! To anyone that knows me personally, I LOVE Harry Potter with a passion – the books, the films, the whole idea of it all is magic to me – and I can read & watch it countless times and never get bored… so the cake was a big task. I wanted to do something a little different with the cake – try and keep it wedding cakey, and elegant – but still obviously complete the gorgeous theme of the wedding – I wanted to make sure that it would be something that I had never seen, and therefore hopefully something that none of the guests, or more importantly the Bride & Groom, had never seen – so thats when I came up with this beauty. The Gryffindor sponge was Red Velvet – with a little edible snitch on top (the bane of my existence because of the weather!). The Ravenclaw layer was Chocolate – as everyone loves chocolate. 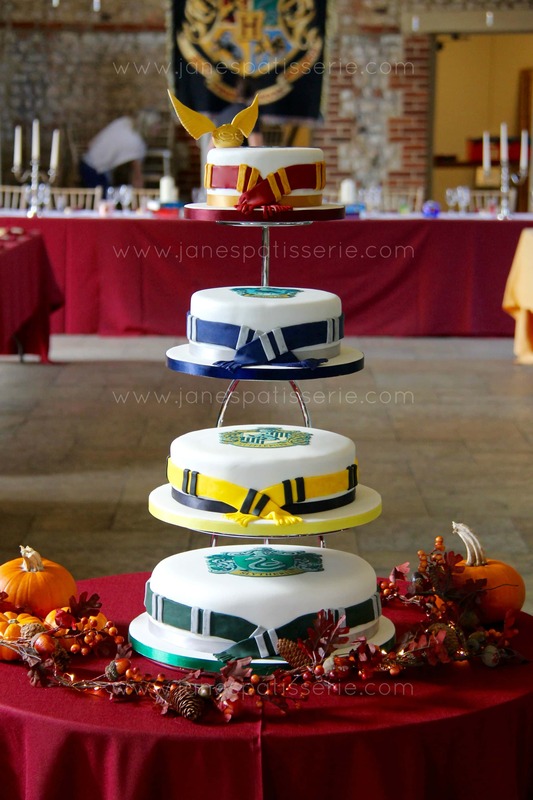 The Hufflepuff layer was Lemon, a personal request from the Bride! And the Slytherin layer was Pistachio – as they all loved it! 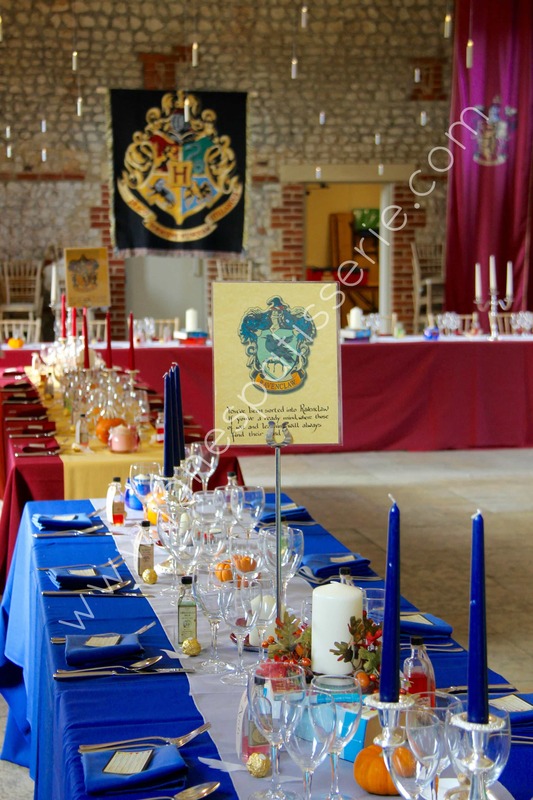 The Wedding Venue itself was this absolutely gorgeous little barn that had been dressed up with the house crests like they did in the films, and all of the table decorations were so inthralled with detail that it was amazing too see everything I love about the film, everywhere!! The colours were bright and vibrant, and everything was stunning! 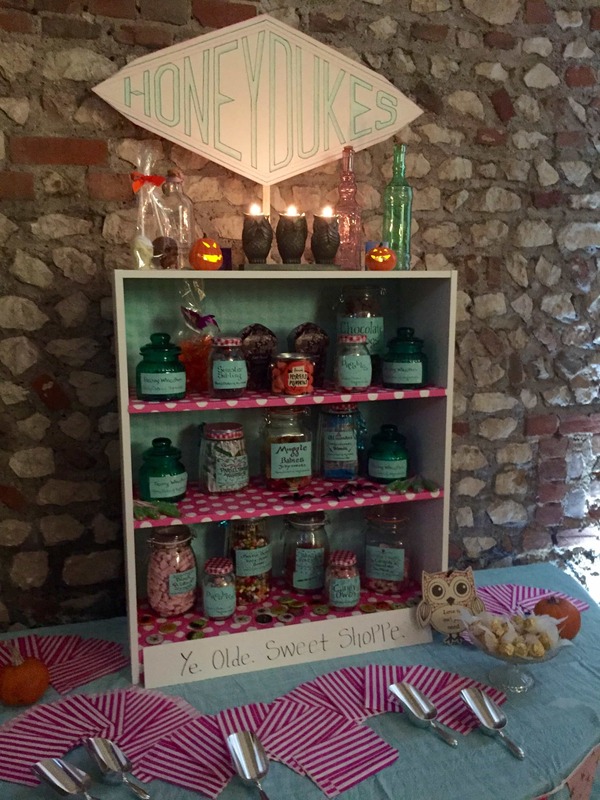 The Wedding Reception was glorious – with a photo booth with handmade details to pose with, a ‘Honeydukes’ Sweet Shoppe, and the glorious venue lit up with Candles everywhere – it was stunning! Older Next post: Sugar Cookies! Newer Previous post: No-Bake Salted Caramel Cheesecake! Awwh thank you so much!! Jane this is absolutely amazing. LOVE the cake. Wonderful! I can’t wait to show my daughter, who has read the books about 10 times. It’s beautiful! 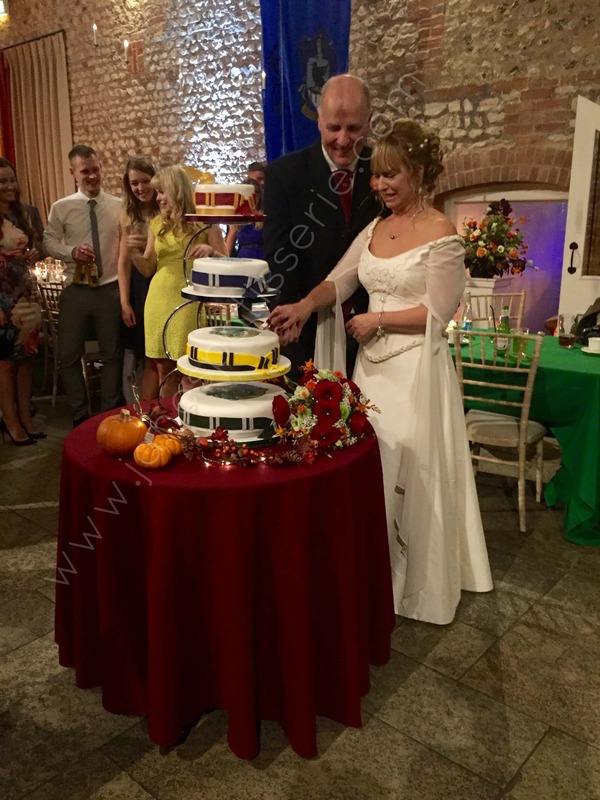 The cake and wedding! Jane, this is so beautiful. Everything is stunning. I really adore your bakes and this? Wow!! Awwh haha thank you so much!! Oooh yes!! and thank you! only a potter fan could have pulled it off so beautifully. Awwh haha thanks Priyanka! I’m definitely a very big fan! Absolutely amazing! Finally saw the details of this cake! Close up and personal! Jane you are amazing! This great! 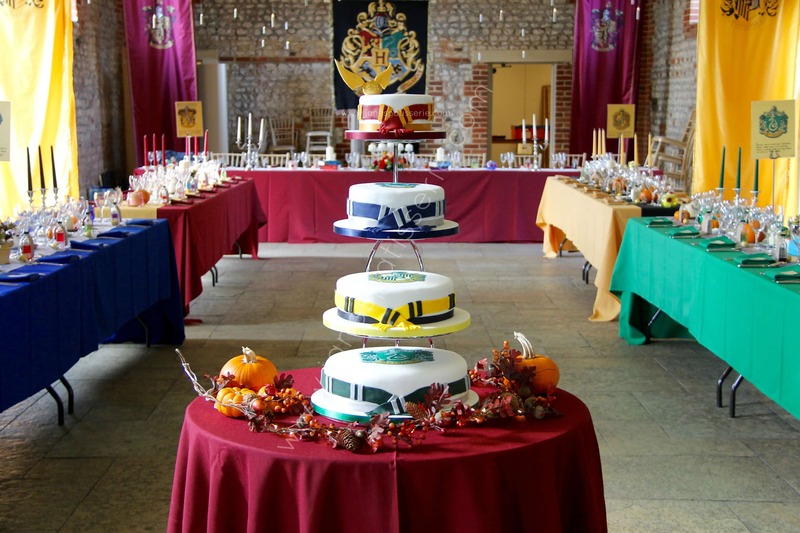 As a Potter fan myself, I wouldn’t mind this cake for my wedding! Lol, you are very talented! Ohh thank you Amber – thats so lovely of you to say!! Amazing and Gorgeous!! My daughter is a Harry Potter fan and she is so excited to see this cake. 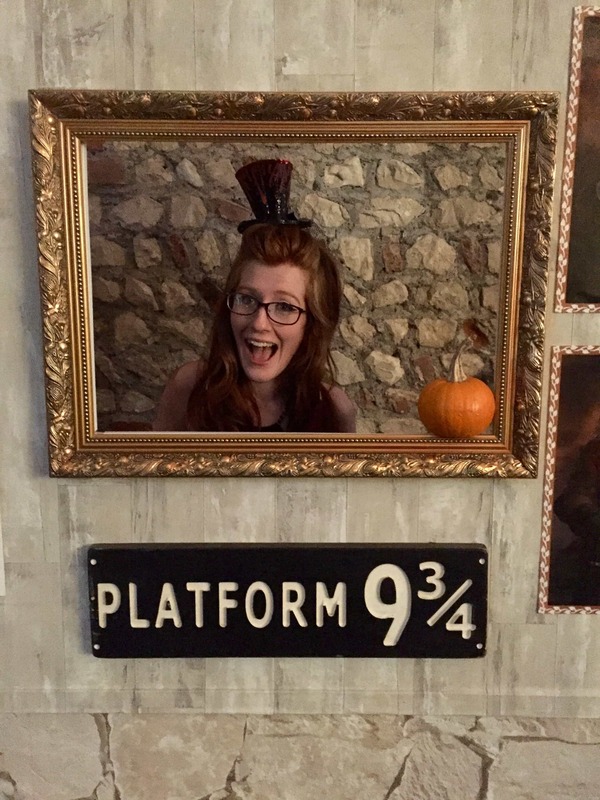 Hehe I love harry potter so I was so happy to make it! Thank you!! Comment from my sister: “I’m only twelve but when I grow up I need this for my wedding cake!” ?? It looks amazing Jane, well done! Your cake is beautiful and so creative! Also, this is probably my dream wedding, haha. Its my dream wedding too – I literally want it all so bad! And thank you! Wow…this is awesome and the cake looks perfect! So this is the best wedding ever. That cake is SO beautiful! You should be so proud of yourself! 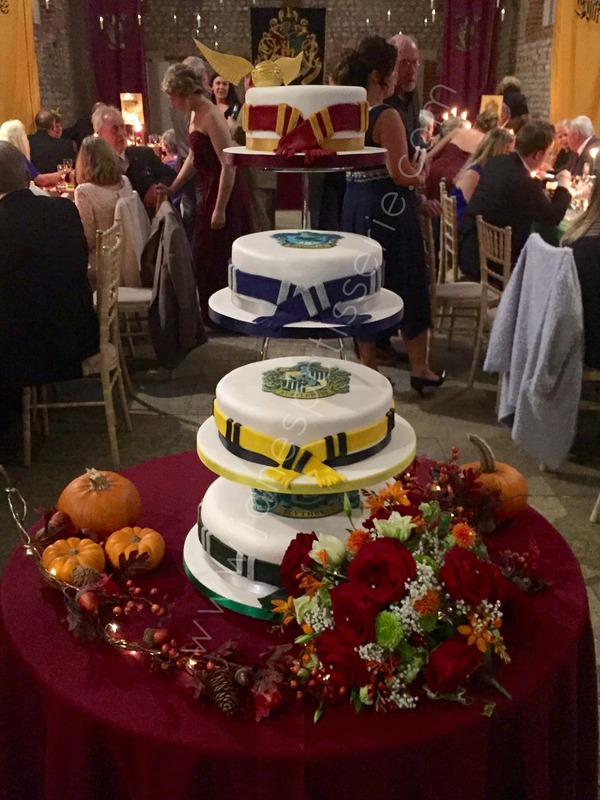 What a fun and beautiful wedding with a stunning cake! Well done. Amazing. As ever. But I think you may have outdone yourself this time! Aww thank you Claire! 🙂 And I used flower paste in the end – just had a few spare in case they snapped! How absolutely fantastic! The room looks brilliant and the cake looks amazing well done you! Thank you! 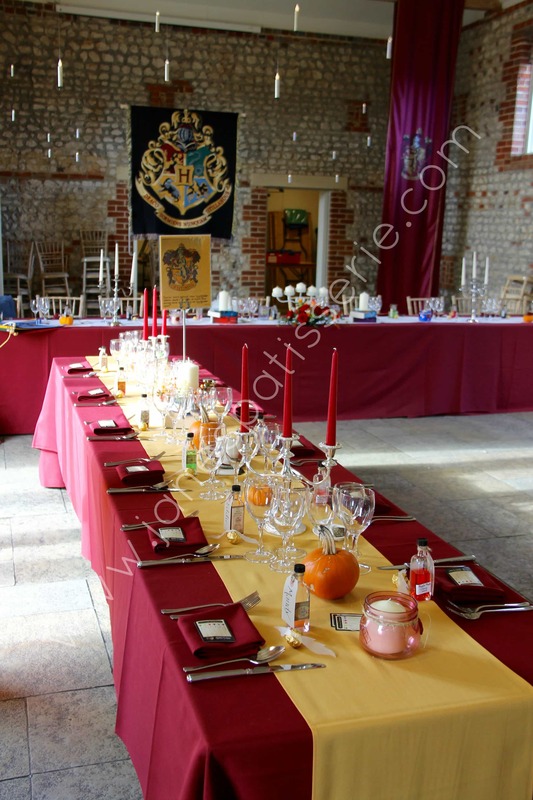 They did such an amazing job with the venue didn’t they!! Jane ! You have excelled yourself. What a stunning display. Well Done You!